Tactical Solutions' "Trail-Lite" is a lightweight aftermarket conversion barrel for the Browning Buck Mark Series semi-automatic pistols. 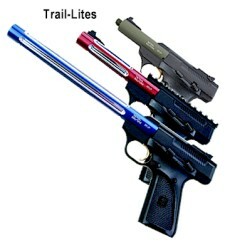 Trail-Lite barrels come in 4", 5.5", and 7.25" bull barrel lengths, as well as a 4" barrel with a threaded end. The barrels are anodized in black, matte black, gray, olive drab green, matte olive drab green, and red. Each Trail-Lite barrel is machined to exacting standards from solid aircraft 6061- T6 aluminum bar and matched to a premium quality 1-16" twist chrome-molly steel liner. We do not ship barrels out of the USA.